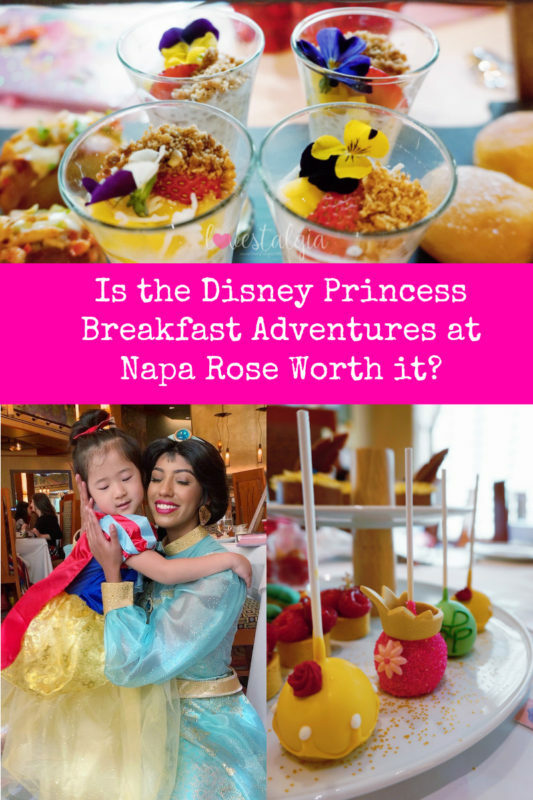 Home Disney	Is the Disney Princess Breakfast Adventures at Napa Rose Worth it? When: It opens to the public on Saturday, March 30th. Food Offerings: 3- course meal consisting of appetizer, main course and dessert as well as drinks. Alcoholic and non-alcoholic options are available. There are also food offerings for those that have dietary restrictions or allergies. Cost: Adults & Children (3-9yrs) -$125/ person (No AP discount), Children under the age of 3 may participate in the character interactions but won’t get the amenities/gifts. 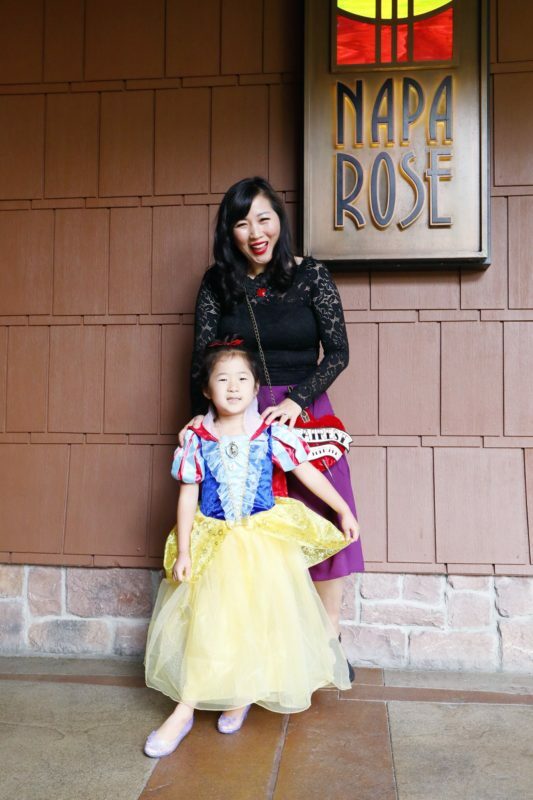 Character Meet & Greets: You get to meet 8 princesses. The princesses are ones whose stories focus more on adventure and bravery. The whole breakfast experience took about 2 hours or so. I think we were there for about 2 1/2 hours because we took a long time eating and enjoying everything. 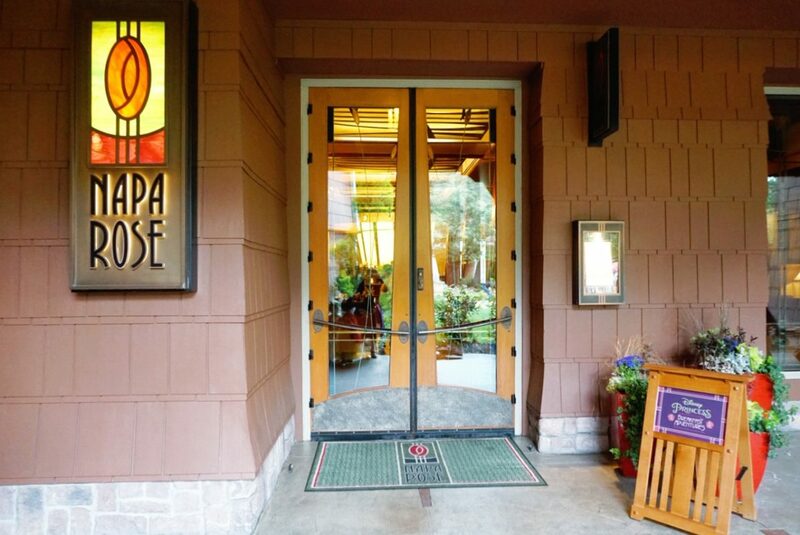 Upon entering Napa Rose, we checked in with our hostess to begin our adventure. We were asked if we had any dietary restrictions and then A got to pick an autograph book and pen. An Adventure Guide escorted us to the lounge area where a guitarist was playing music as well as a cute game of tic-tac-toe that we could play while we waited to be seated. We also signed the Adventure Book (guest book) which was located near the front of the lounge. This was also where we were able to interact with the first princess before our princess breakfast adventure– Rapunzel! I was offered either sparkling wine or sparkling cider while we waited to be seated. After a short time, an Adventure Guide came to guide us to our table. We were seated and introduced to our assigned Adventure Guide who would be the go-to person for all of our adventures for the day. We ordered drinks and he answered any questions we had. 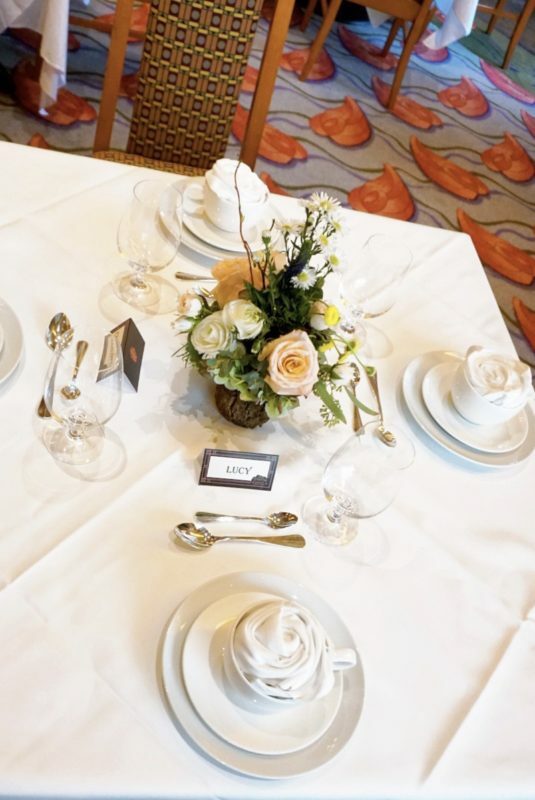 The table decor was simple with one flower arrangement and place setting. Our Adventure Guide told us that the princesses handpicked the flowers! Our Adventure Guide also dropped off a mini tic-tac-toe game that the kids played with while enjoying their beverages and pastries. The cutest thing for me was the place setting with the napkin shaped like a rose! I wanted to leave in the cup! I also thought the place card with your child’s name added to the magic and made the experience more personalized. 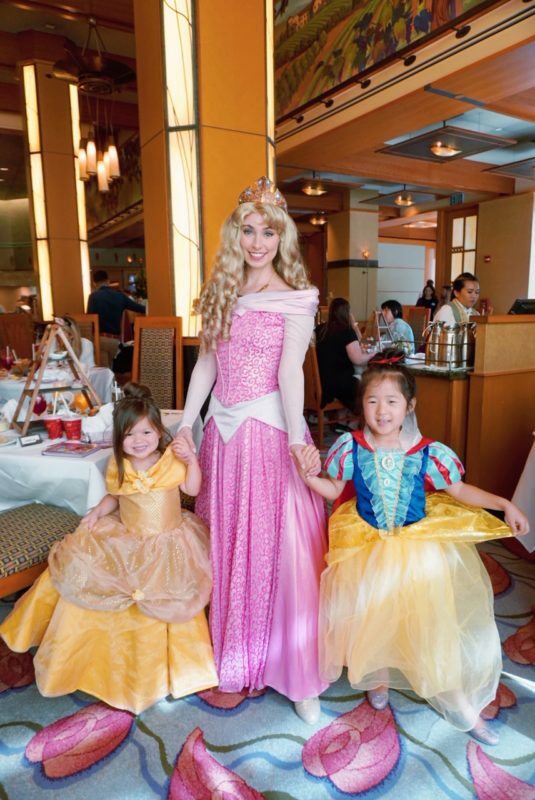 While we were enjoying our 3-course breakfast, the princesses walked from table to table to spend time with guests. We didn’t have to stand in a long line. We didn’t have to have people rush us or stare at us because we were “taking too long” interacting with a character. It was such a special time for A to talk to each princess. The little conversations they had were so sweet whether it was with Belle and her love of reading or Jasmine teaching the girls how to ride a magic carpet- it was so so magical! 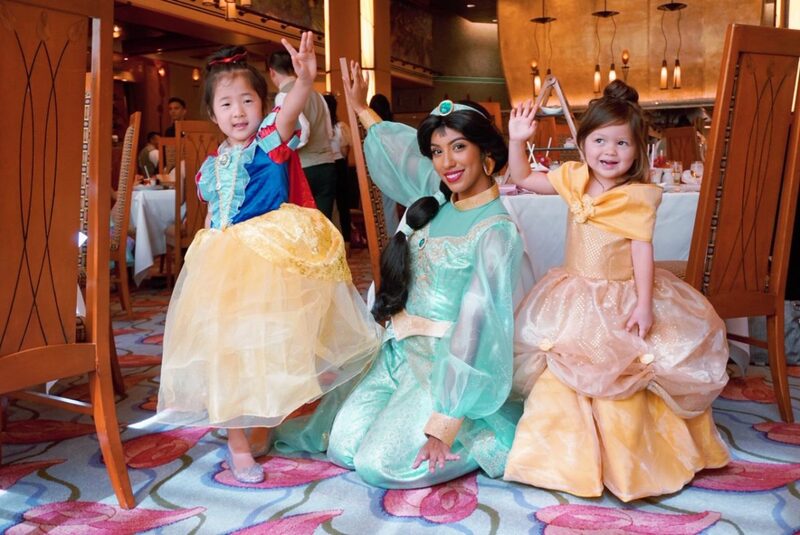 During the meal we met four princesses- (Belle, Tiana, Jasmine, and Aurora). They came in one at a time about 20-30 minutes apart. The princesses often knelt down so that they would be eye level with the kids. They spent time asking them questions and answering any questions they had. I loved that it was uninterrupted time and that the kids were able to soak in the stories of adventure that each princess had to share. 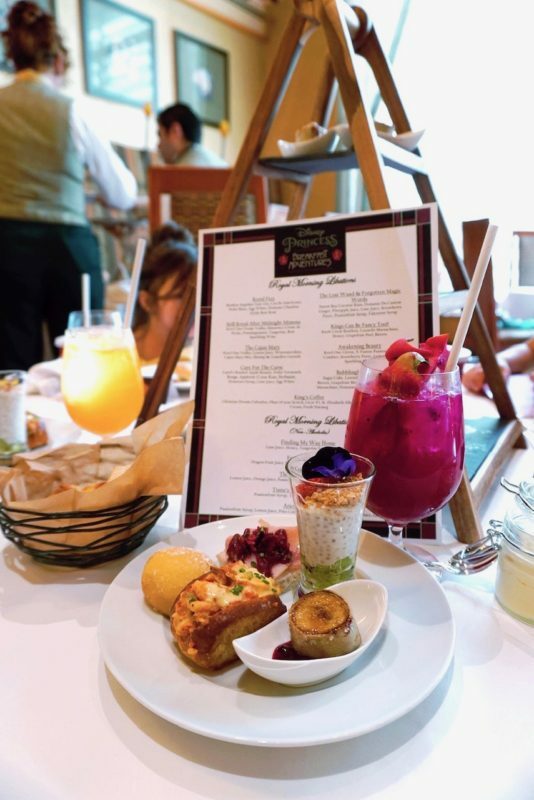 For our first course, we enjoyed a pastry basket filled with scones and lemon monkey bread plus lemon curd on the side. 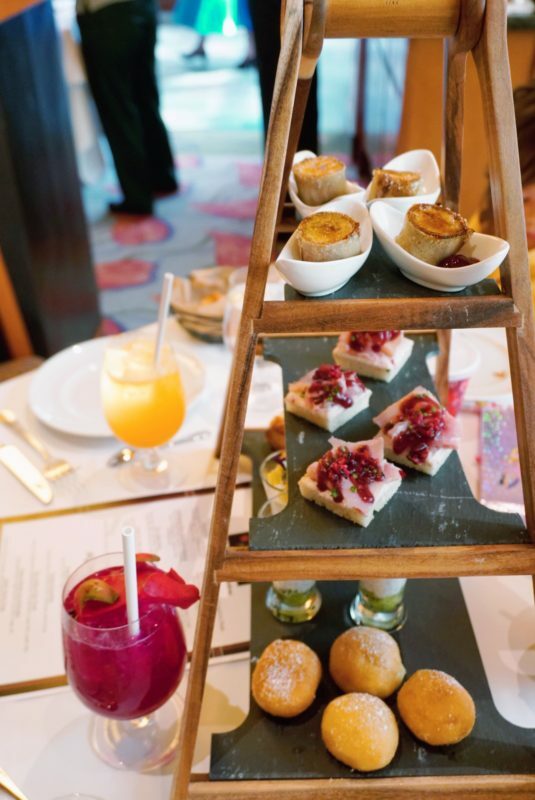 Then the 3-tier tower arrived full of delectable treats to continue our food adventure! Abu’s Banana Wrap– A Nutella crepe, wrapped around a sliced banana with caramelized sugar and berry compote. Tangled Sandwich– Open faced ham sandwich with cranberry cream cheese. 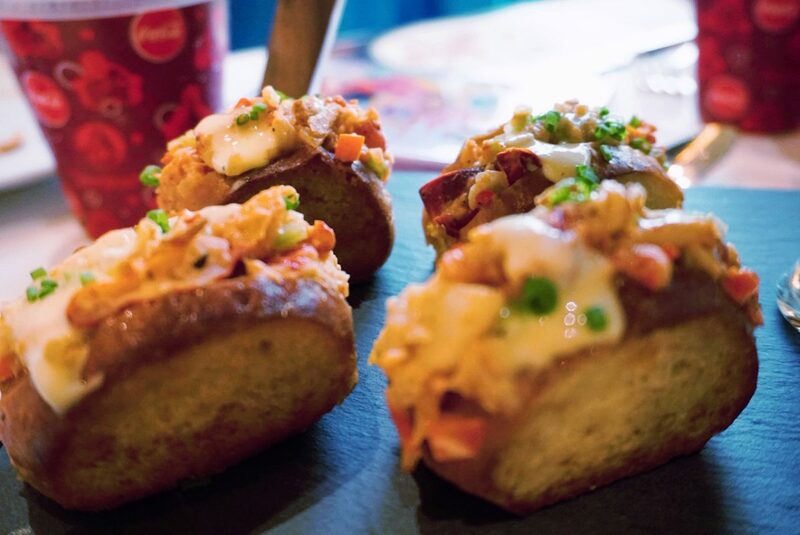 Lobster Roll- Lobster salad in a brioche roll. 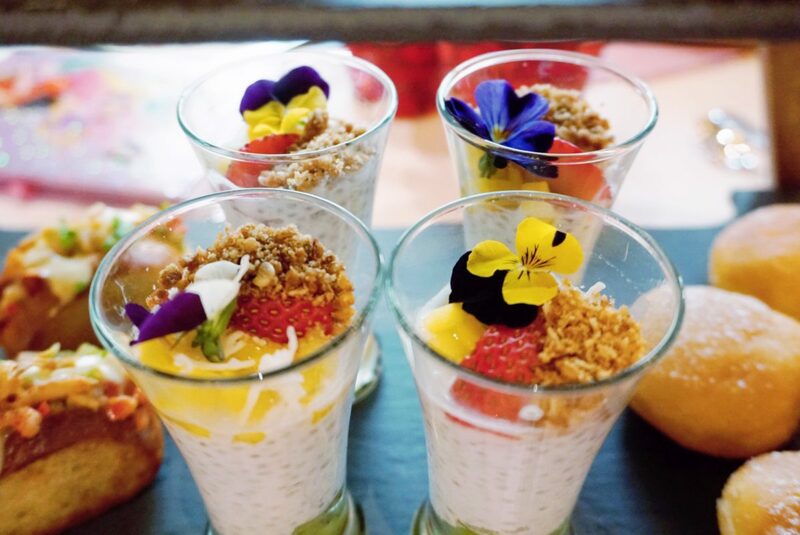 Magic Carpet Ride Parfait– Chia pudding with kiwi, mango, and topped with granola and coconut on top. Tiana’s Beignets– Tiana’s famous beignets!! All the food items in this course were so beautifully presented and so delicious! I personally liked all of them. My picky eater tried a little bit of each but didn’t eat a lot except the beignets. My favorite was the Braised Short Ribs. It was so moist, flavorful and literally melted in your mouth. The eggs WERE really perfect and you can’t go wrong with chicken and waffles! My picky eater loved this course and ate her chicken, waffles, bacon and fruit. Now, if you’re not full by now, you’ll be full after the third and final course– DESSERT. Our Adventure Guide brought out the tiered dessert tray and I literally gasped at how beautiful it was. The desserts were almost too beautiful to eat! These are the desserts that come on the tray. 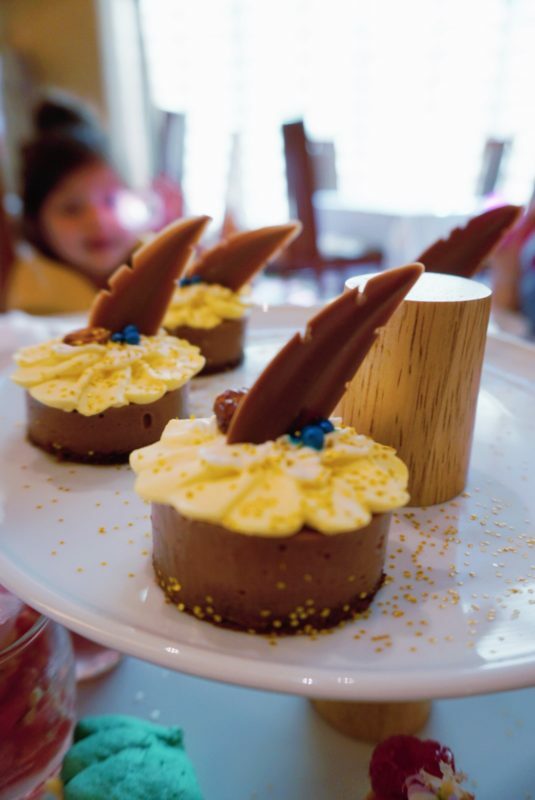 Pocahontas’ Peanut Butter Crunch– Peanut butter mousse topped with a chocolate feather. There’s a thin chocolate cookie as a base and to add texture. 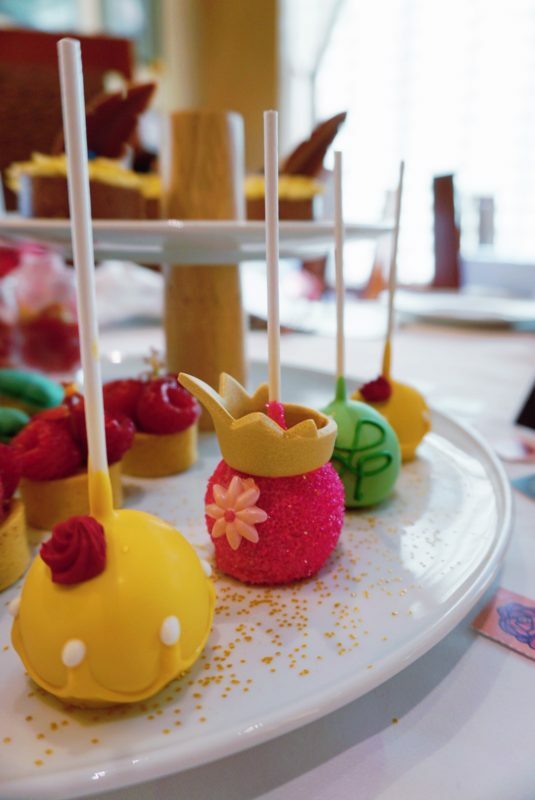 Chocolate Cake Pop– An assortment of cake pops decorated like some of the adventurous princesses. Belle’s Bouquet-Lemon tarts, topped with raspberries and edible flowers. Ariel’s Mango Seashells– Sea shell macarons with mango passion fruit ganache and a white chocolate pearl. Mulan’s Firecracker Sorbet-A refreshing raspberry sorbet topped with cotton candy and a layer of rock candy to literally add some pop. Obviously this course was a hit with A and me too! How beautiful are the desserts!!?? I loved how thoughtfully they were themed and executed- Mulan’s Firecracker Sorbet with rock candy?!? Genuis! After we finished our courses, we were guided to the last part of our princess breakfast adventure into the great outdoors for a special story time with one of the princesses. While the kids listened to a story, adults could enjoy some coffee or tea. By this time, we were more than stuffed so we didn’t have anything else. 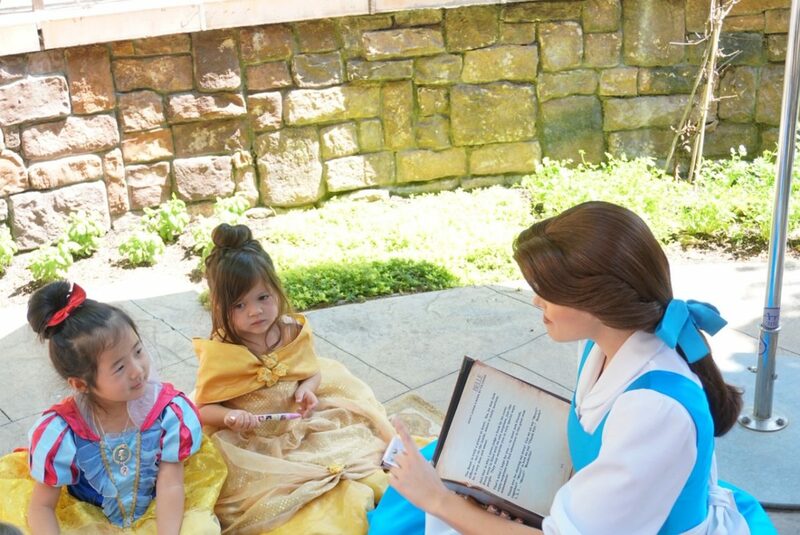 After story time, the kids were led by our Adventure Guide to learn a skill from another princess. Mulan taught them some warrior skills and talked about being brave even when you don’t feel brave. Some of our friends were able to meet Pocahantas to learn how to canoe. 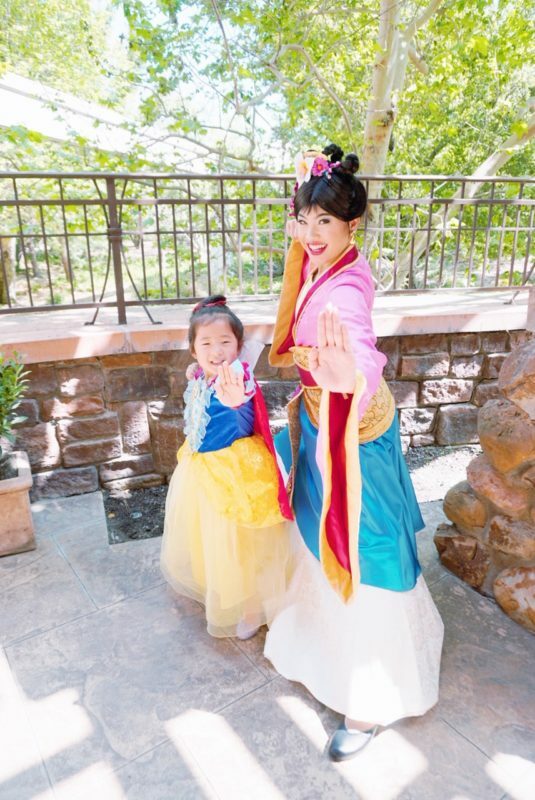 After Warrior Training with Mulan, our Adventure Guide guided us inside to have a PhotoPass portrait taken with one of the princesses. 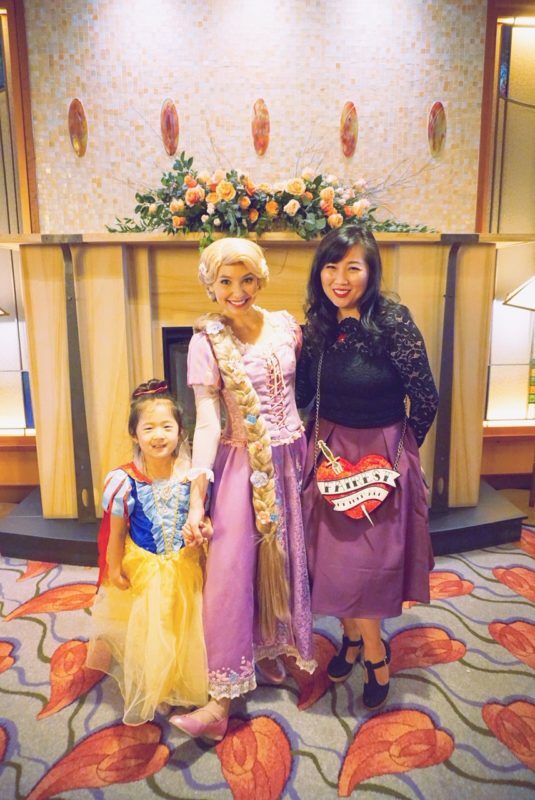 We took pictures with Rapunzel again. After that, we went to the lounge area to meet one last princess (Ariel), pick up our special gift (a foam sword and shield or crown necklace) and then head home. 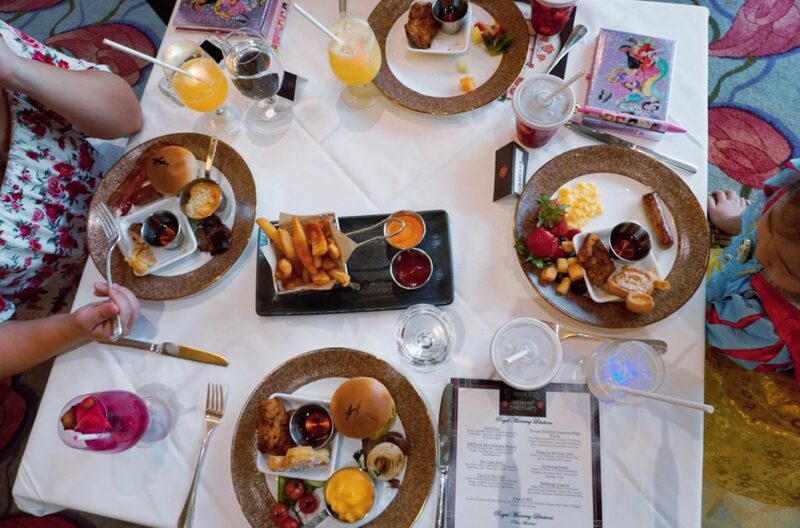 It’s not in everyone’s budget to spend $125/person on one meal BUT this experience is such an amazing way to celebrate a birthday, milestone, reunion or other special occasion! 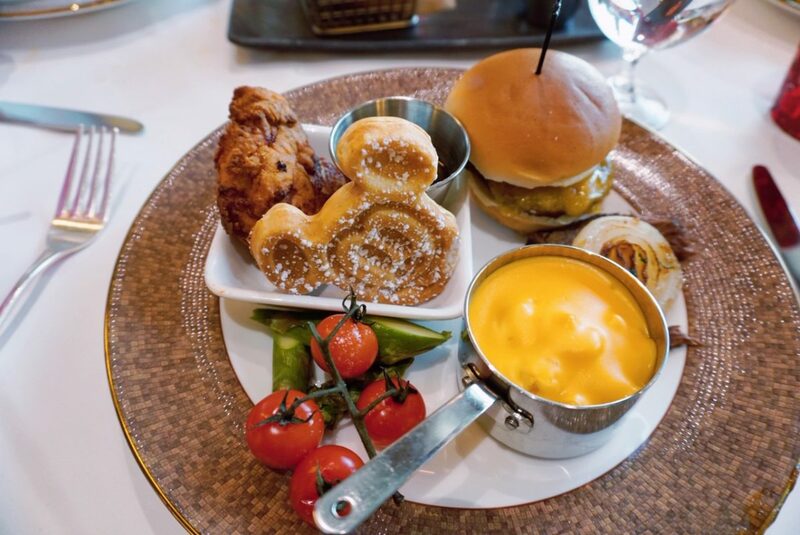 It’s not “just another character dining experience.” It’s so much more! 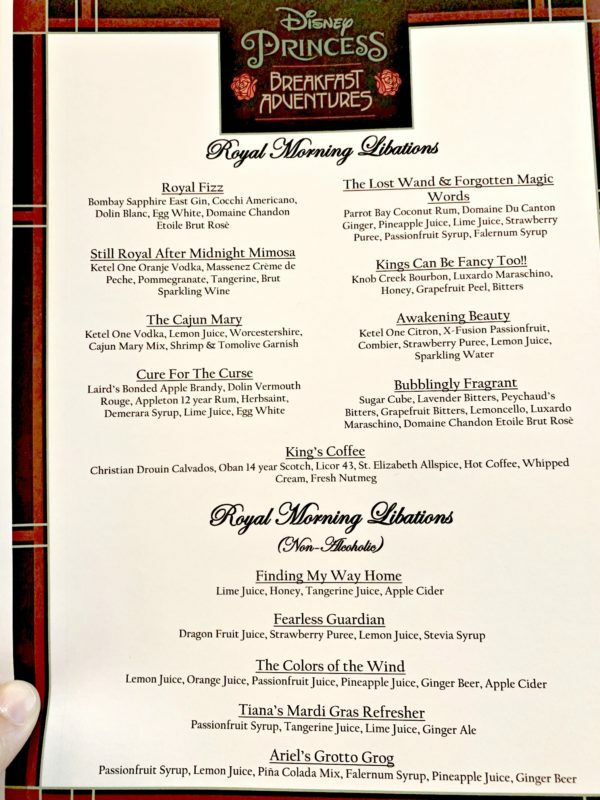 To be completely honest, when I first heard about the Disney Princess Breakfast Adventures, I was so excited. Then I realized how much it would cost and the excitement turned to disbelief. However, after experiencing it, I think it’s well worth the cost! First course appetizers and the Fearless Guardian non alcoholic beverage. (Contains Dragon Fruit Juice, Strawberry Puree, Lemon Juice, Stevia Syrup.) Can be made alcoholic if you wish. 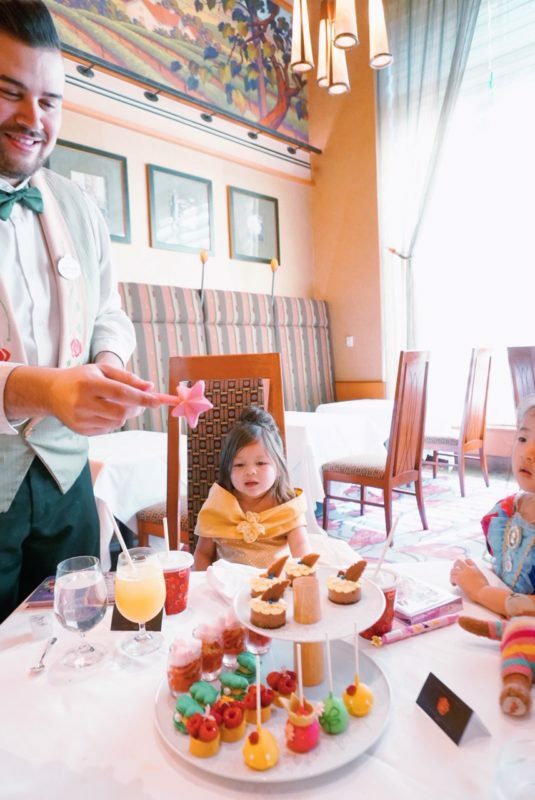 But more than the things you get, you are getting a chance to experience exceptional service, amazing and attentive interactions with some of your favorite princesses, and creating magical memories for the adventurer in your family. It literally turned out to be the BEST DAY EVER!!! 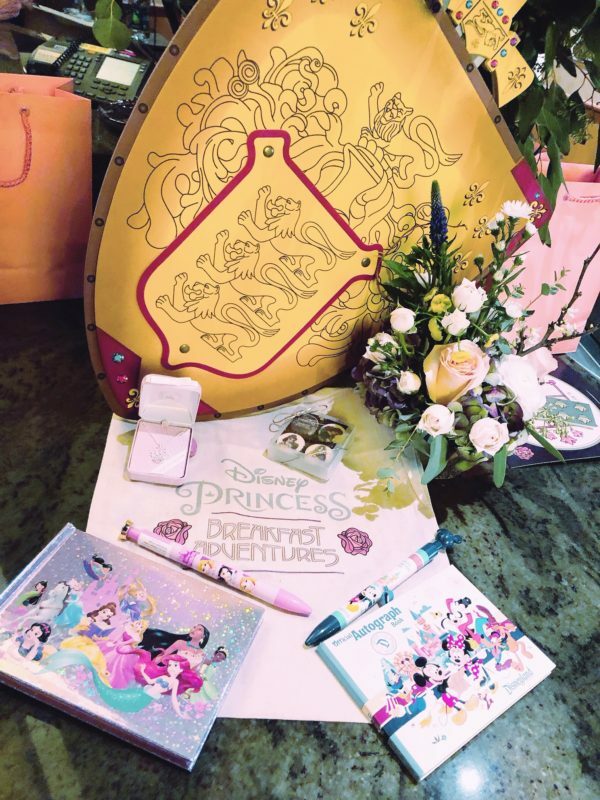 This would be a great way to end your Disney vacation and surprise the little prince or princess of any age in your life! Maybe even have a girls day out to celebrate a birthday or bridal shower? You can see videos of the experience on my Instagram Story Highlights. Check out Jenielle from Little Gray Threads or Carly from Lipgloss and Crayons’ posts for more coverage and their reviews. Jessica from The Healthy Mouse also talks about food options for those with dietary restrictions. 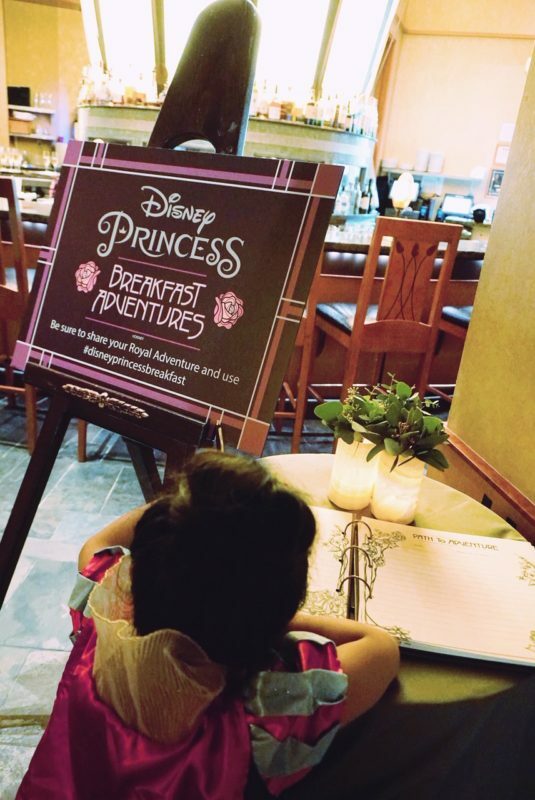 You can find out more or book a reservation for the Disney Princess Breakfast Adventures here!